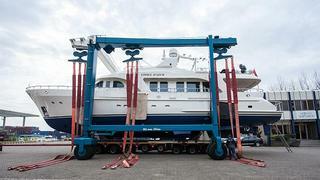 Moonen Shipyards in the Netherlands reports the successful completion of the refit of the 26.25m Moonen 84 Etoile d’Azur. The five-month refit project included a comprehensive paint job and the installation of an electrical zero speed stabilisation system in place of the existing hydraulic system. The electrical system requires approximately half the power of its hydraulic zero-speed alternative. Another major part of the refit was to extend the flybridge to cover the main deck aft area, creating even more shading for alfresco dining. In addition, the enhanced flybridge deck space meets the owner’s wish to carry more watersport toys onboard, including scooters, in addition to the tenders and jetski already stored in this location while underway. Etoile d'Azur is now en route to Scandinavia where the owner will enjoy an extensive cruise of the Norwegian fjords and beyond.